You may have heard of books and movies about a boy who finds out he is a wizard and a celebrity in the wizarding world after surviving an attack on his family by a dark sorcerer. Did I give too much away? The author of the seven-book Harry Potter series, J.K. Rowling, has become quite the marketer since the success of her books, with a fan base that extends further than most books. Here are three things we can learn about marketing from Rowling’s success. Rowling adores her fans and appreciates their input and better yet…she responds to them. She loves to give her fans mysteries to solve and plenty of clues to help solve them, much like a massive online scavenger hunt. And the fans have learned to keep a watchful eye for any tidbit of new information from the world of Harry Potter that she so generously shares. 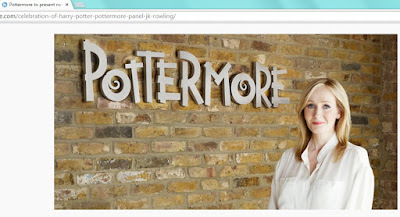 She even launched a fan website called Pottermore in 2009 as a place for her readers to keep the online discussions going, leading to a steady stream of viewers and readership. “Muggles” (non-magical folks) go crazy any time Rowling releases new content. And most of her new stories can be read for free. Her readers have fallen in love with the fictional world of Harry Potter and love any companion pieces from the wizarding world. One way to keep interested readers coming back is to give them more and more rich content from the same vein, not only in the form of books, but also in the form of free content. This can take many forms. Free short stories on a website or on Amazon. Blogs, Tumblr posts, Facebook updates, podcasts, or even tweets. Anything that expands and enriches already established content with a loyal following can serve as unique material for content marketing. Rowling is an extremely gracious author when it comes to her vast community of fans. She is thankful for the loyalty of her fans and doesn’t hesitate to tell them how much she appreciates them. It also helps that she is a maternal figure to actors Tom Felton (Draco Malfoy) and Matthew Lewis (Neville Longbottom) for example. Rowling’s community of fans offers a sense of belonging and friendship to those who share common interests. If more and more people enjoy a book while feeling like they belong “in the community,” they will recommend the content to others and anticipate the next publication, creating a self-sustaining cycle of demand. It’s important not to become complacent and keep the writing streak going strong. After all, the point of content marketing is to grow your business and ultimately create a few conversions. The larger your audience, eventually, the larger your business will grow. Rowling may have been successful from her fictional works, but non-fiction can be just as effective. We each have the ability to grow an online presence, but consistency and rewarding fan loyalty is key. Start an informative blog about something that interests you and start reaping the benefits of online readership.